Have you noticed that you’re not receiving WordPress emails? Unfortunately, WordPress not sending emails is a common problem, but it’s easy to fix. In this tutorial, we’ll walk you through how to set up WordPress email notifications with SendGrid using WP Mail SMTP. This can be a tricky problem, because you may not notice that WordPress isn’t sending form notifications until people start filling out your form, and their messages don’t reach your email inbox. You might notice form entries in your WordPress dashboard that haven’t been sent to your email, or discover there’s a problem when frustrated visitors reach out to you using social media or other methods. By default, WordPress uses the PHP mail() function to send emails generated by WordPress or any contact plugin like WPForms. The most common reason for missing these emails is when your WordPress hosting server isn’t configured to use the PHP mail() function. SMTP (Simple Mail Transfer Protocol) is the industry standard for sending emails. Unlike the PHP mail function, SMTP uses authentication which increases email deliverability. That’s why we recommend using SMTP to send emails in WordPress. Why Use WP Mail SMTP with SendGrid? There are many different SMTP services available, but many of these aren’t secure. 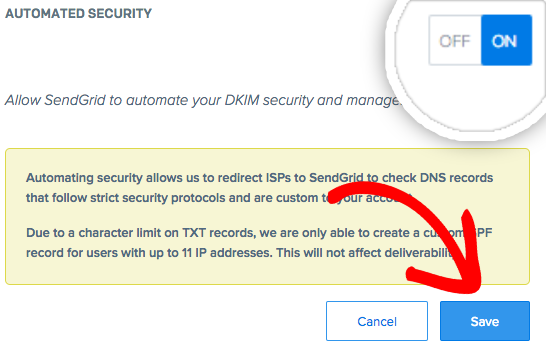 While other methods require you to store sensitive login information in your WordPress dashboard, using SendGrid in WP Mail SMTP will keep your email passwords secure. SendGrid offers a free plan for sending up to 100 per day. For most small businesses and personal websites, that’s plenty. If you need to send more, you will likely need a paid service. Before we can configure your website to work with SendGrid, we need to set up an account and find your SendGrid API key. This key is a unique identifier and a secret token for authentication that will allow your website to interact with your account at SendGrid. 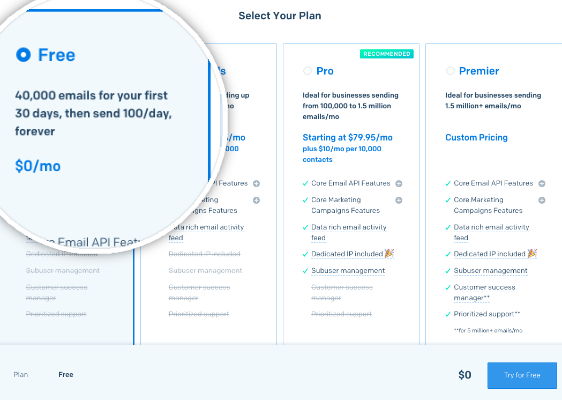 First, you’ll need to sign up for a SendGrid account by visiting their Pricing page. From here, you can choose the account type that fits your site’s needs. For our example, we’ll be signing up for their free account (limited to 100 emails per day). Next, you’ll need to fill out a couple forms to create your account and set up a profile. 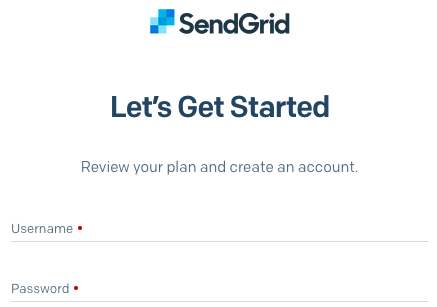 When creating your SendGrid account, be sure to use the same email address you’d like to set the From Email to in your form notification settings. These emails will need to match in later steps. 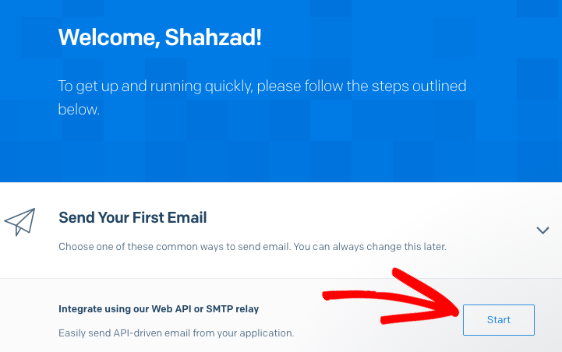 After creating an account, click the Start button next to Integrate using our Web API or SMTP relay. Next, you’ll be asked to choose a setup method. 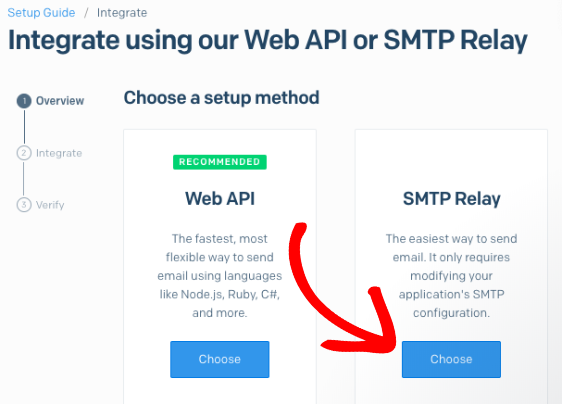 You can now click the Choose button under the SMTP Relay option. On the next page, you’ll need to enter an API key name and then click Create Key. Once the API key has been generated, you’ll be ready to go to the next step. Be sure to leave this page open, as we’ll need this API key a little later. 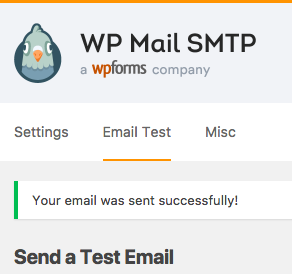 Now we can get started setting up SendGrid with WP Mail SMTP on your WordPress site. First, install the WP Mail SMTP plugin. Here’s a step by step guide on how to install a WordPress plugin. 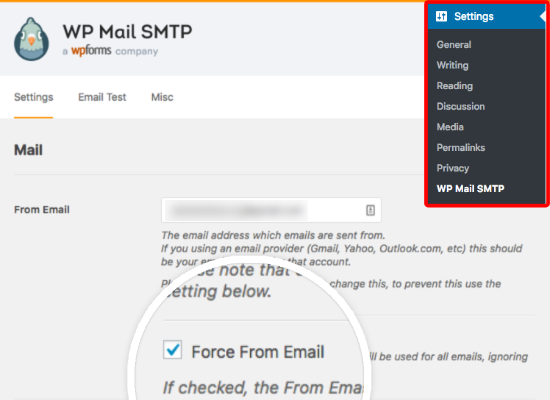 While in your WordPress dashboard, go to Settings » WP Mail SMTP. For the From Email, be sure this is set to the same email address used to set up your SendGrid account. We also recommend enabling the Force From Email option. 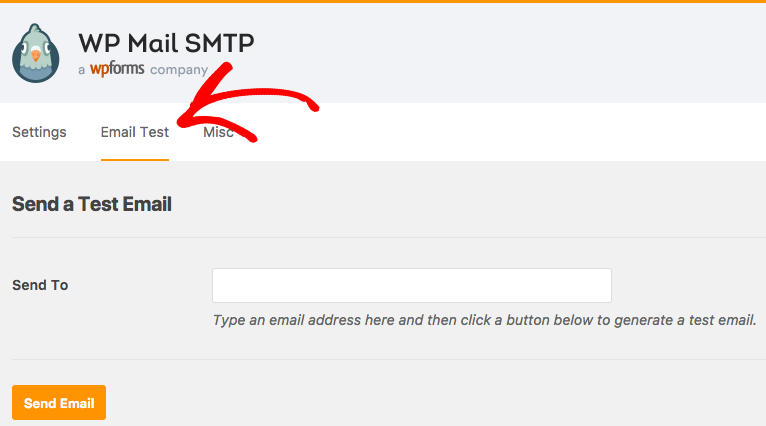 Since you will need the From Email in all plugins that send email to match this email address (a requirement in order for SMTP to work), this option will save you the trouble of editing the email settings throughout your site (in all form emails, etc). Then in the Mailer field, select the SendGrid option. Though optional, we also recommend checking the Return Path option to Set the return-path to match the From Email. That way, you’ll be notified if any messages bounce due to issues with the recipient’s email. The last step on this page is to scroll to the SendGrid section and enter the API Key. Go ahead and flip back to the tab or window where your SendGrid account is open to copy the key you generated earlier. After copying the key, return to the WP Mail SMTP settings and paste it into the API Key field. Once these settings are saved, you’ll be ready to try sending a test email. To do this, click on the Email Test tab. Once the email has processed, you should see a success message. If you check the inbox for that email address, you should also soon receive the email for this test. Let’s finish by verifying the integration we just created. To do this, check the box labeled I’ve updated my settings and then click Next: Verify Integration. When the next page loads, click the Verify Integration button. This will send an email to SendGrid for verification. 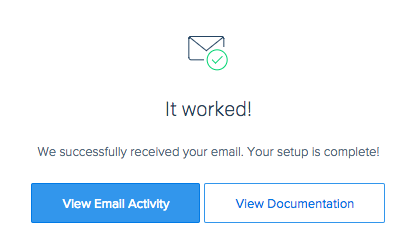 Once the email has arrived to SendGrid, they’ll let you know with a success message. This may take a few moments to complete. If you’d like, you can stop here and submit a form to test email delivery. However, for long-term delivery success we recommend proceeding to the next steps to verify your domain and whitelabel email links. The best way to ensure that your emails continue to deliver successfully over time is to verify your domain. In SendGrid, this is called “whitelabeling”, which means that your emails will appear to come from your own domain rather than SendGrid. 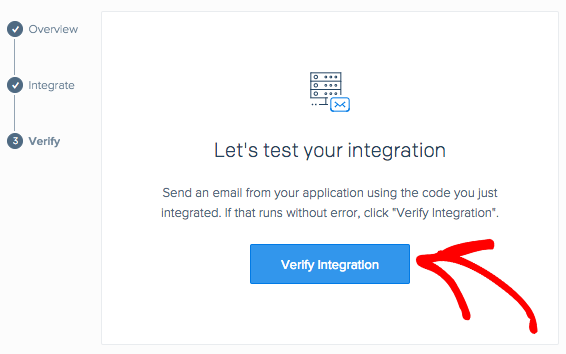 To get started on verification, you’ll need to open Settings » Whitelabels in SendGrid’s left menu or follow this link. Then, click the + Add Domain button. This will open a new panel, where you’ll need to enter a subdomain to use for whitelabeling. For our example, we’ll use the subdomain “em”. – Not using “mail” as many hosting companies will already use this and it could cause conflicts. You can leave the Automated Security option set to On, then click Save. Saving these settings will cause an overlay to appear. This will let you know that we still need to make DNS changes, which we’ll do in the next step. 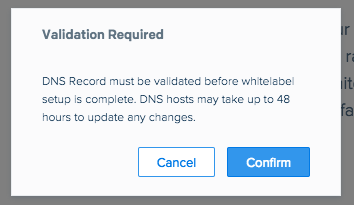 After clicking Confirm, the next page will display a list of DNS records that you’ll need to add for your site. For more details on modifying your site’s DNS, we recommend WPBeginner’s tutorial on DNS settings. If you have additional questions about DNS or feel unsure about making changes, please contact your site’s hosting provider. After adding these DNS records, click the Validate Records button. DNS changes can take up to 48 hours to be recognized, so you may need to check back on this later. In the meantime, let’s continue to the other part of whitelabeling: Email Links. Whitelabeling email links will allow any links in the emails that are sent to use your own domain, rather than SendGrid’s. This will help to further ensure delivery by keeping all links tied to your own site. 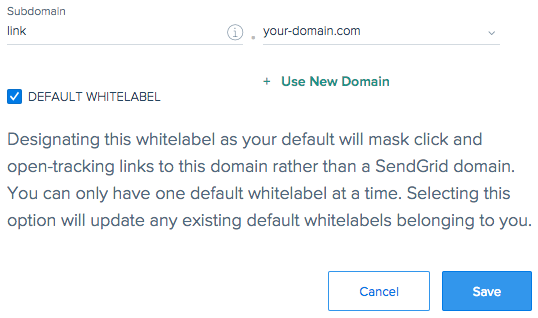 To whitelabel email links, return to Settings » Whitelabels in SendGrid’s left menu. Then, click the + Add Email Link button. In the overlay that opens, you’ll need to enter another subdomain to be used in email links. This can be anything you like, though SendGrid’s documentation suggests “link” or “click” as good options. For this example, we’ll use “link” as our prefix. Then you’ll need to select your domain and Save these settings. Just as we saw in the previous step, an additional overlay will appear reminding you that DNS changes will take up to 48 hours to take effect. Go ahead an click Confirm. On the next screen, you’ll be provided with two additional DNS records to add to your site. After adding these records to your site’s DNS, you can check back here click the Validate Records button. Remember that this may take a while, so you may need to check back again later. Note: Be sure to submit a couple of test forms after completing this setup to check that emails deliver successfully. 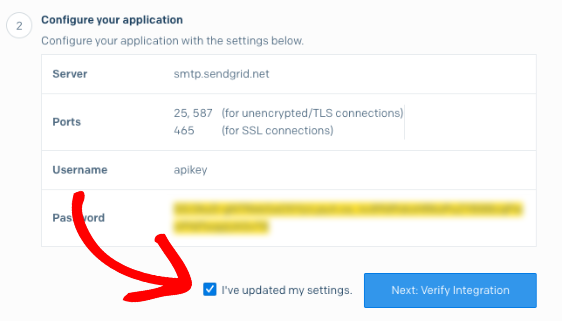 If you see any issues, we recommend setting the From Email in your form’s notification settings to the same email you set up SendGrid with. That’s it! When WordPress can’t send emails, you’re able to fix the problem. Now you’re ready to fix WordPress email notifications with SendGrid using WP Mail SMTP. I am setting up a local server to build a web site and need to add SMTP services. I am using the WP Mail SMTP with SendGrid API key. All works very well with the exception of any email address with @yahoo.com in it. The emails are held and never delivered by Yahoo. Is there something I need to do to register the SendGrid account to allow yahoo to process the deliveries? I found an article from SendGrid that suggests Yahoo.com emails may not work well as the From Email in general. Though we have seen users successfully use Yahoo emails for this in some cases, mostly using the “Other SMTP” mailer option, it may be best to use an different email address if possible. I’m sorry for the trouble with that, and I hope this helps! Im using this plugin with sendgrid, and email still go to spam for instance when sending to gmail… any idea why what might be? If your test email for WP Mail SMTP is working, but email is still going to spam, the next step is to check the From Email in whichever plugin on your site is sending the email. In WPForms, for example, you can set the From Email by opening the form builder and going to Settings > Notifications. Just wanted to say that after much frustration trying to get these forms to function properly this tutorial saved my sanity. Appreciate your attention to detail – was very easy to follow and everything is working like a charm now, thanks! Send grid settings have changed. Would be great to see an update on this procedure to match current send grid settings. Absolutely – thanks for pointing this out! It looks like they’ve had a pretty significant redesign recently. We’ll be updating this tutorial as soon as possible. I have a client; we’ll call her Sally. I have a Contact Form on her WordPress site. I also have the CF send an autoresponder to whoever filled out the CF form. 1) If I set up her SendGrid account using sally@website.com and then that tries to send the email to her inbox; sally@website.com, will that cause an issue? Sally is on microsoft for her email and her DNS. 2) Also, when you talk about “whitelisting” and “using a subdomain” do I literally have to set up a subdomain for Sally’s site? If yes, do I literally have to install WordPress on it? This is very useful information that you have shared. What you’re describing with the emails should work fine with SendGrid (though always wise to test in case there’s something unusual). In regards to your question about the subdomain, you don’t actually need to create one. As long as you follow along with all of the steps in the tutorial, there should be no issues when setting this up.